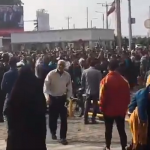 The protest by workers of Fulad-Ahvaz and their families and other fellow citizens continue despite heavy security measure by the repressive regime. Saturday marked the 15th consecutive day of strikes for Ahvaz Steelworkers and the 20th consecutive day of strikes for the Haft Tappeh sugarcane factory workers. The striking workers have continued to stand up for their rights despite repressive actions by the Iranian regime, based on reports from the MEK sources inside Iran. The striking Ahvaz Steelworkers rallied on Saturday in front of the governorate in Ahvaz and marched toward the Pol Sefid. Police confronted the workers and assaulted some of the protesters in an attempt to stop the demonstration, but young people who had joined the protest in support of the striking workers forced the police to retreat. The protesters chanted “Lest we are humiliated!” as they marched to Naderi Street. 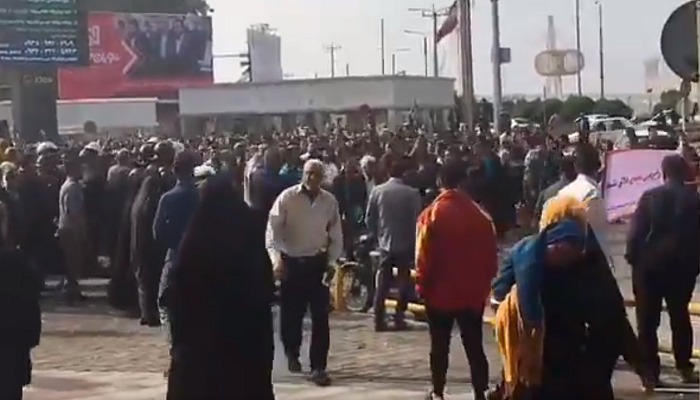 Also on Saturday, the Haft Tappeh sugarcane factory workers gathered in front of the governorate in Shush to protest the recent false statements by the regime’s Deputy Minister of Labor. The deputy minister claimed that the workers had all received their unpaid wages and returned to work and that the strike was over. The striking workers responded to these lies with a rally. They made banners reading, “Imprisoned workers must be freed!” The workers chanted, “Even if we die, we will get our rights!” The MEK network shared video of the protests on social media. Regime authorities arrested 19 Haft Tappeh factory workers for taking part in the strikes and protests. After their fellow workers pushed back and rallied for their colleagues’ release, the regime relented and released 14 of the workers. Five of the factory workers are still detained. Mrs. Maryam Rajavi, President-elect of the National Council of Resistance of Iran (NCRI), commended the striking factory and steel workers for continuing their strikes despite the regime’s repressive measures. She further called upon all the people of Khuzestan to stand in solidarity of the oppressed workers and to support their strike. She specifically called upon the youth of Iran to support the striking workers. Mrs. Rajavi also called upon trade unions and workers’ rights activists to condemn the labor policies of the Iranian regime and to support the workers’ strikes in Iran. The MEK has pledged its support for the striking workers.